Plastic bag recycling is often touted as a solution to the environmental damage caused by plastic bags, but it just isn’t that simple. Through increased education and outreach programs, plastic bag recycling is in fact on the rise. However, recycling plastic bags is not as efficient (they get stuck in the machinery) or effective as recycling other materials such as paper or glass. There are a wide variety of plastics out there and different types of plastic require different handling and processing for recycling. Throw into the mix the fact that plastic bags are often contaminated with food or other forms of waste, which complicates the handling and recycling process, and what seemed like a good idea, becomes a massive undertaking. Despite the uptick in plastic bag recycling, there is still a gigantic amount of litter unleashed every day. For example, only 1 percent of plastic bags are recycled worldwide — about 2 percent in the U.S. — and the rest, when tossed will persist for centuries contaminating not only our land but our oceans and fish as well. Eating fish is generally considered healthy, with some varieties like salmon being considered a super food. For the last few decades, the most well-known issue concerning eating fish has been mercury. When mercury pollution gets into the water and contaminates fish, people who consume these mercury laden fish may suffer ill effects. Now it seems that just as mercury levels are dropping in our air and our fish, now research is showing that some fish plucked from our oceans have plastic in their bellies. Although there is still a lot of exploration to be done to determine the full scope and the impact on the food chain when fish eat plastic, if fish plagued by other contaminates pose a health risk, logic would dictate fish that consume toxic plastic are also potentially harmful. This can be frightening because it can have a direct impact on people’s health and can impact a major food source. To learn more about how plastic gets into our oceans and on our dinner plates check out this article from The Huffington Post . People who use reusable bags usually cite the environmental reasons as their incentive to tote sustainable bags – less pollution and less harm to animals and their habitats. Concern for the environment is a great and valid reason to forgo disposable plastic bags in favor of eco-friendly bags, but concern for your own health may also be a consideration. As plastic pollution continues to permeate soil and bodies of water through litter and lack of recycling, the ramifications of this pollution are growing bigger and more severe. 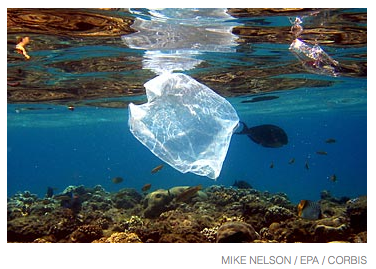 A simple change like switching to reusable grocery bags can prevent wayward plastic trash from floating in oceans and accidently being ingested by fish and eventually by you.